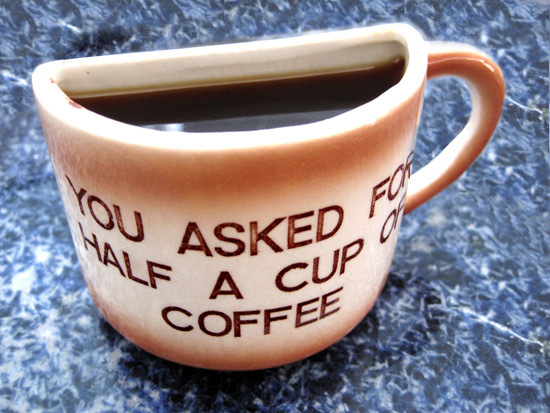 I cannot tell you how many people ask me if they can keep this vintage cup after I serve them the half a cup of coffee they ask for. Tons of these were made as state souvenirs. Lots of different styles. Not always easy to find but as of this morning there were 8 on Ebay. Run. 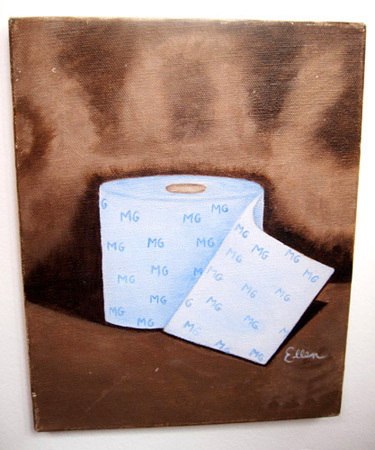 Not sure what about “MG” inspired his or her initials to be painted on a roll of toilet paper but I’m elated that the artist known as “Ellen” squeezed the oils out for this masterpiece. Too many obvious jokes here so I’ll leave them up to you. Tho I must say the choice of dark brown for the background color is appropriate. I especially love Poodle Boy’s Liza Minelli dayGlo green hair, his little paw hands and the way his angora-on-speed sweater reflects on his eyelids. Poodle Girl’s excellent 60′s Russ Meyer meets Charo hair, Angelyne lookalike vibe and dayGlo harlequin top more than make up for the fact that she’s painted so low on the canvas she has no hands, paws or whatever you call that body part on such a species. 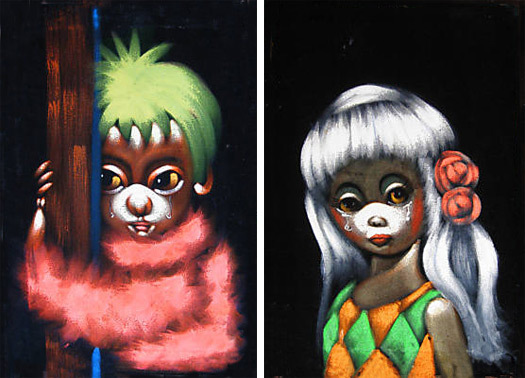 Not sure what the inspiration was for these weeping canine twinged youth but the fact that these velvet paintings are slightly common didn’t deter me from popping down the $1.25 it took to own the set as a great Kitsch collector should never pass up human subjects with snouts and whiskers. With my favorite monument in LA, Angelyne, billboard goddess/ Corvette collector. Yes, I really know her. Yes, she ran for Governor. Yes, she bakes a mean brownie. Yes she’s for real. 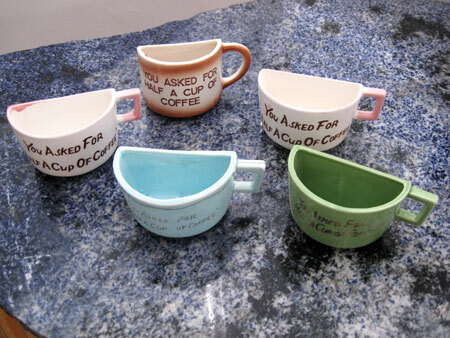 Allee Willis’ Kitsch O’ The Day – Happy Sunday! Hippies claim Jesus as their own with this late 60′s pinback button. 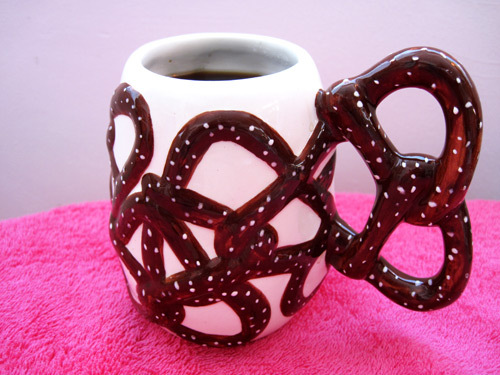 One of the ugliest things I own this pretzely mess of a coffee mug, almost 7″ high, holds enough caffeine to keep me buzzing through this lockdown weekend of song and video deadlines. 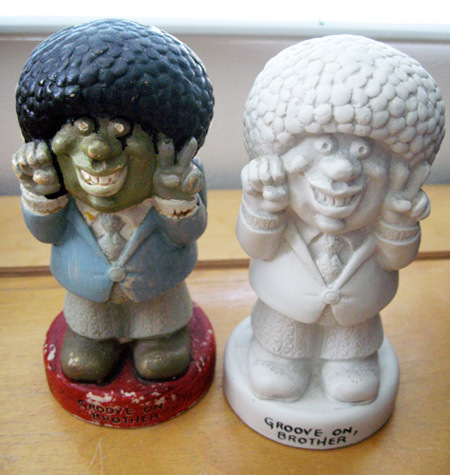 You know I think almost anything with an afro has groove to it but how these overstuffed lumps o’ rubber afro power came to symbolize the quality of groovin’ must be attributed to the fact that they were made for the apple pie American Greetings Corp. Vintage 1972, when everyone had a groove. 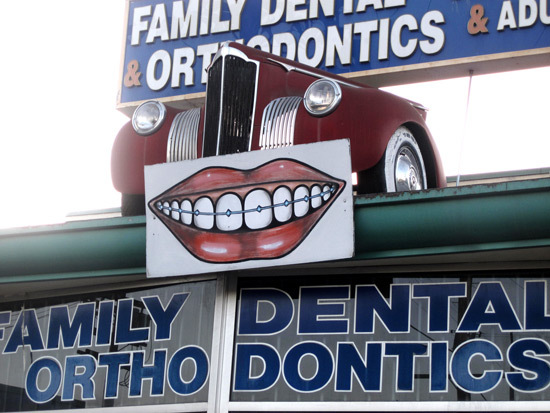 Not sure of the connection between cars and bad teeth other than they both need to be repaired but apparently this Mt. Washington, CA. dental establishment thinks there’s enough of one to justify blocking part of their signage. The sparkle on the lips kills me too. Oftentimes, despite having been handed a coaster, drunk guests miss the mark and their glass leaves a big white circle on your favorite table reminding you to never invite them again. 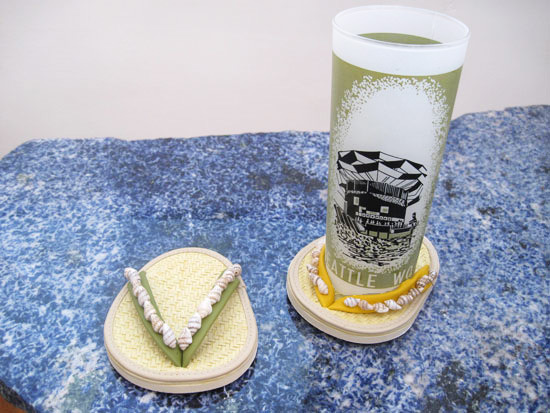 This miniature thong grips the drink – as all good thongs do their subjects. Glasses raise with thongs attached so happy landings and pristine tabletops are guaranteed. Kitsch Honorable Mention For Excellence In Packaging Copy: On the front: “For body and back”. The last time I looked my back was part of my body. 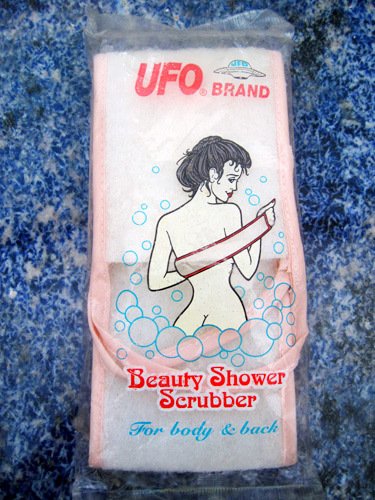 On the back: “Cleaning Products that are out of this world”. I’m thinking they make janitorial supplies. I googled them. They do.